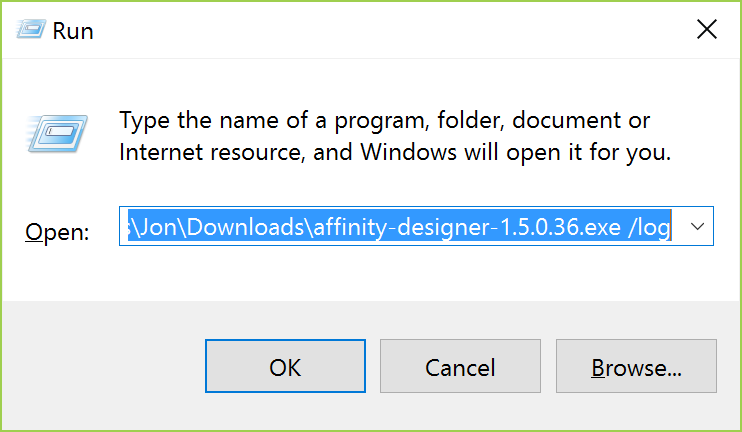 Unfortunately I can't install Affinity Designer on Windows (Windows 10 x64). Screen with choosing language popped up and then.. nothing happened. I looked and the task manager and it just crashing. This problem occurs also with Affinity Photo beta. Welcome to the forum! Are you able to install Microsoft's .NET Framework 4.6.2 from here, restart your PC and then retry the installer please and see if that helps? I shall have to get an install log from you! 1. Go to %temp%\AffinitySetup\ and ensure that is empty. After this steps there is no 'Install.txt' file. I see only "Affinity.msi" so I tried to install Affinity with this file. I thought that everything runs properly, selecting destination folder, enter my email, product key, create desptop shortcut > Finish. Nothing in C:\Program Files\Affinity ? No.. after this "installation" there is no such folder as Affinity. It sounds like you didn't add the "/log" option. We would really like to see the resulting Setup.log file - could you try again please?